It was strong windy yesterday, but today it was really silent in Shirahama. There were only 2 couples in the beach. One of them was walking along the beach side and sometimes taking a photo. When I was taking a photo I noticed one thing. It was about 3:30pm. The sun was setting ….. 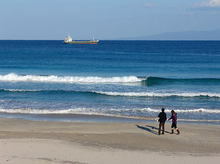 This entry was posted in beach, nature on 2006年2月9日 by izusakuraya.